Kathy Liebert began playing poker as a prop player—a player who gets paid by casinos to start poker games or keep them going. It wasn’t long before the love of the game set in for this current Las Vegas resident and soon, in 1994, she was playing full-time. Her claim-to-fame is winning first place in the Party Poker Million for—you guessed it—one million dollars. Unfortunately for her, she had made a deal with Berj Kacherian and Phil Hellmuth, the second and third place winners, and she only went home with about half the proceeds. Still, today she ranks fifth on the World Series of Poker winnings list for women. As of 2017, she has won over $6.1 in live tournaments. She was born in Tennessee but grew up in Long Island, New York. She attended Marist College in Poughkeepsie, New York; where she earned a BS degree in business and finance. From there, she worked at Dunn and Bradstreet as an analyst, but after a year, she was looking for more out of life so she high-tailed west to Colorado and found that she really enjoyed playing poker. She also loves reading poker books. Although Liebert has made a career out of poker, she still uses her financial knowledge to invest in the stock market. In addition to the ups-and-downs of poker, she enjoys playing the ups-and-downs of the stock market. In 2006, she placed 5th in the WPT World Poker Finals. In 2005, she took 3rd place in the WPT Borgata Poker Open. 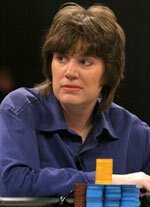 In 2004, Kathy won her first World Series of Poker bracelet for Limit Hold’em. Kathy also holds a blue belt in karate. PokerSource.com is the best site for free poker money and free poker gifts promotions online. Visit the Open Directory Project, GamCare or Wikipedia for more poker info. Copyright © 2004 - 2019 PokerSource.com - All Rights Reserved.